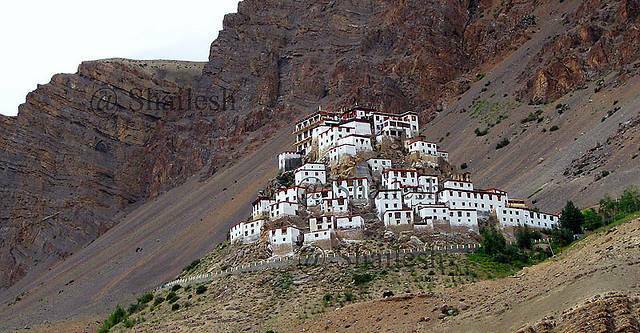 Key Monastery or Key Gompa is the biggest monastery in Spiti Valley and is dedicated to Tibetan Buddhism. At an altitude of 4,166 mts, this monastery is home to about 300 monks who receive their religious education here and is a splendid example of Chinese influenced monastic architecture. The Spiti River flows next to the monastery, when it is not frozen during winter months and the monastery is about 12 km from Kaza. The monastery has the facade of a fortress and is decorated with numerous paintings, murals and preserves several manuscripts. Key Monastery has the distinction of being the oldest and the biggest in the Lahaul and Spiti district of Himachal Pradesh and a religious training center for Lamas. Kye monastery is an outstanding example of the monastic architecture, which developed during the 14th century in the wake of the Chinese influence. The Mongols plundered the monastery in the middle of the 17th century. In the 19th century, it again suffered three brutal attacks. The successive trails of destruction and patch-up jobs have resulted in a haphazard growth of box-like structures, and the complex now resembles a defensive fort.